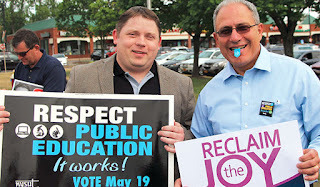 NYSUT President and UFT Unity loyalty oath signer Andrew Pallotta (pictured at left with illustrious NYSUT Secretary-Treasurer Martin Messner) just sent me an email. It says, "New York's political insiders are throwing a party and we aren't invited." That's an interesting assessment of the NY State Constitutional Convention, which many politicians currently oppose. For the record, I oppose it too, and I ran a COPE drive in my school to help enable opposition. This is my eighth year as chapter leader and I never did a COPE drive before. That's because UFT supports some questionable causes and candidates. Pallotta, along with UFT leadership, ousted former NYSUT President Richard Iannuzzi for objecting to donating thousands of member dollars to Cuomo. While Cuomo has backed off some of his more reprehensible comments and positions on education, I don't believe that has any fundamental effect on his overall lack of principles and integrity. It certainly doesn't save me from being rated on how six beginning ESL students perform on the Common Core English Regents exam this year. Who knows how many others are rated in an equally absurd fashion? There was a pretty big party going on at the New York Hilton last week and I wasn't invited, not by Pallotta, not by UFT leadership, and not by anyone. Most UFT members probably don't even know it happened, but our dues sent 750 loyalty oath signers to midtown at a cost I'd guess to exceed half a million dollars. There they elected Pallotta and his gang to run the state union. I went anyway, as the guest of the Port Jefferson Station Teacher Association. Oddly, they wanted me there even though my own union didn't. I was pretty surprised to get a really dirty look from a Unity Caucus member I'd previously deemed myself on good terms with. But make no mistake, this was their party and it was completely private. How private? Well, though we all know that Pallotta won a majority of the delegate votes of the 48% of eligible unions who could afford the trip to the Hilton, we don't know the percentage, and we don't know who voted for him. In a fair election, in fact, we shouldn't know who voted for him but NYSUT actually keeps records. That way UFT would know if some loyalty oath signer violated the terms of his agreement and needed to face expulsion. Expulsion for failing to two the line is a long and hallowed Unity tradition, dating back to the days that Al Shanker tossed people for failing to support the Vietnam War. Some Unity people I respect swear up and down that they've never signed a loyalty oath, but you can read the Unity application right here and come to your own conclusions.Who voted to support mayoral control under Bloomberg? Who voted to continue it under Bloomberg when it was well-established to be an unmitigated disaster for working teachers and the schools they served? Why would anyone in a union support that if they weren't compelled to do so? Why did UFT Unity demand a few changes, fail to get them, and then support it anyway? Yes, there's a party going on. Almost none of UFT rank and file were invited, and 100% of those who were voted precisely as they were told. Although a majority of my high school brothers and sister voted for me to be one, all UFT delegates are "at large." That's precisely because the high school teachers tend to vote their consciences and leadership is having none of it. So we have absolutely zero representation in NYSUT, though we enjoy the great honor of paying them dues. That goes for AFT as well. Oh, and by the way, we will never be privy to the actual voting results. They are available only to delegates, and from what I hear they haven't even got them yet. Not a delegate? Screw you. Not only do you not get to see how your delegates voted, but you also don't get to know how much Pallotta won by. Just shut up and pay your dues, thank you very much. Me, I don't want a party. I want fundamental democracy. So with all due respect, Mr. Pallotta, until 52% of NYSUT locals and 20,000 NYC high school teachers get a voice and a vote in NYSUT, you have some gall telling me about whose party we're excluded from.